The 18 year old will join Jorge Prado on the factory KTM 250 SX-F after catching the eye with a moto victory, five top-three race finishes and three podiums in the 2018 EMX250 European Championship. 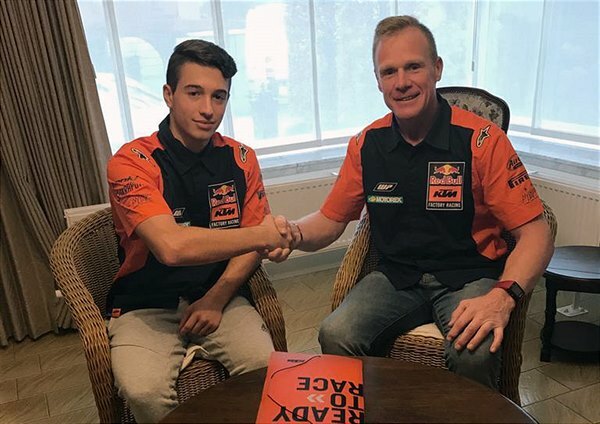 Vialle, son of former Grand Prix rider Frederic, was competing in EMX250 from the confines of his own set-up before drafted into the LRT KTM squad in the latter phase of the season. Vialle will come under the stewardship of Motocross Manager and five times World Champion Joel Smets and MX2 Team Manager Dirk Gruebel as part of the Red Bull KTM set-up and will fill the awning next to MXGP World Champion Jeffrey Herlings for 2019. Tests and training with Tom have already begun this month.